The Carson Animal Shelter in Gardena, California, is not the place where hopes and dreams are made of, to say and write the least. The cash-strapped, city-funded shelter grapples with overcrowding. As the increasing demand for kennel space grows with each passing day, Carson is forced to make “hard decisions,” to maintain population control, using euthanasia as a “tool,” to free up “valuable space,” according to my source embedded at the shelter. For one young, unnamed chihuahua who now makes Carson his temporary home, he could tell you all about the politics of the place if he could talk. 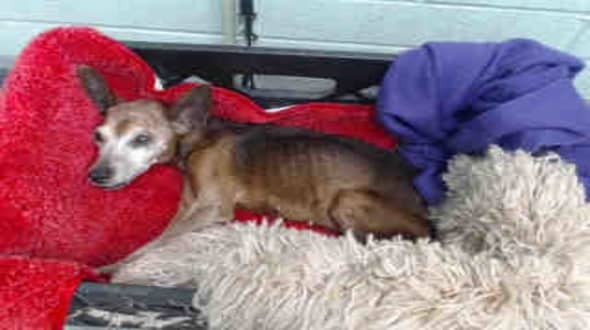 His owner didn’t want him anymore, and so one day she packed up all his belongings, including his favorite blanket and pillow, before mercilessly dumping him at Carson, knowing full well what the ramifications such a decision could potentially bring. #A5185024 I'm an approximately 5 year old male Terrier. I am not yet neutered. I have been at the Carson Animal Care Center since 6/2. I will be available on 6/6. You can visit me at my temporary home at CRECEIVING. 0 Response to "They packed up all his belongings before mercilessly dumping him, too depressed to lift his head"